Some anti-smoking lobbyists and experts are concerned that legalizing cannabis this year could lead to increased tobacco use and sales. According to an Ontario Tobacco Report United report, 31 per cent of cannabis smokers included tobacco in their joints. Adding tobacco to joints — or “spliffs” — gives some smokers a more pleasant, light-headed sensation in addition to the usual psychoactive, muscle-relaxing effects of weed. Other experts are not so concerned by legalization or any apparent correlation between tobacco and cannabis smoking. However, some smokers say that cannabis is easier to give up than cigarettes in the long-term. And many switched to tobacco shortly after smoking weed. Results from a 2016 study by the Canadian Community Health Survey revealed that almost one-half of those who used cannabis on two or more occasions were current cigarette smokers, compared with 17 per cent of those who had used cannabis less frequently or not at all. Experts like Canadian Cancer Society senior policy analyst Rob Cunningham think that the government will need to regulate cannabis differently from tobacco. But the government will still need to warn of the negative effects of smoking. Cunningham also feels uncertainty surrounding the upcoming legalization. While cannabis does not pose the same cancer threats as tobacco, it still has negative health effects, particularly on the brain, says Cunningham. The federal Cannabis Act is going to have some significant restrictions on advertising and has regulatory authority over packaging. But regulations have yet to be announced, despite legalization coming into effect in this year. The government will also need to be careful about what kind of advertising it allows, according to Cunningham. 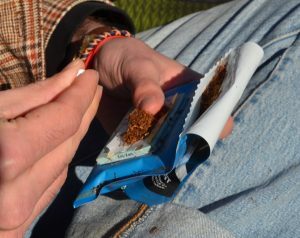 “If the objective is to discourage smoking amongst youth, you probably don’t want to have Bob Marley or a Jamaican flag on the package, because that could make it more appealing and associate it with lifestyle messages,” said Cunningham. Impairment will most likely be the focus of cannabis packaging warnings, rather than cancer risks. Increased heart rate, short-term memory problems, lowered blood pressure and irritation to lungs are just some of the proven negative effects of cannabis use. This will most likely be emphasized once legalization is put into effect, according to Cunningham. An increase in social smoking? A major concern among health experts is social smoking. Many cigarette smokers often begin smoking socially, occasionally having a cigarette with friends or while drinking. This can sometimes lead to addiction. The legalization of cannabis may increase social smoking, a concept that local tobacconists and dispensaries are hoping will grow after the legalization. Quentin Kermeen, a smoke-shop sales associate in Vancouver, said he expects changes after the legalization. He predicts an upcoming emphasis on the social environment in the shop and around the act of smoking cannabis. 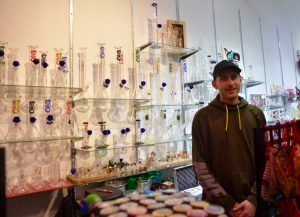 Quentin Kermeen works at a smoke shop in Gastown and is excited about legislative changes. Kermeen says that the shop’s basement and music studio will start having food and drink gatherings. Many cannabis shops will put more of an emphasis on community building. “We’ll have people coming here to hang out rather than just to buy stuff. It will get the energy going,” said Kermeen. However, pro-cannabis lobbyists think that the concerns of anti-cannabis lobbyists are scare-mongering. 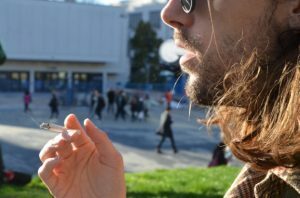 Rielle Capler, a PhD student at UBC and cannabis expert who recently published the thesis “Are dispensaries indispensable?,” is one of many in the pro-cannabis camp who thinks legalization will have little effect on tobacco smoking. In her opinion, legalization will have little effect on cigarette sales. Capler also emphasized that cannabis and tobacco are fundamentally different substances, due to their effects on health, and should not be categorized together. Moreover, Capler believes legalization will be a good chance to educate young people about the risk of smoking cannabis and tobacco together.